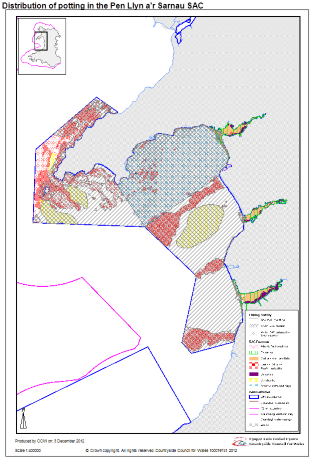 In January 2012, exeGesIS SDM were contracted by Countryside Council for Wales (CCW) to create a set of tools to analyse the distribution of fisheries habitats and fishing activity relative to Special Areas of Conservation (SAC) and SAC Features. The objective of this project was to summarise how the fisheries habitats developed during the CCW habitat sensitivity project (Hall et al., 2008) intersected with SACs, SAC features and fishing activity. This sets the fisheries sensitivity work in the context of the Habitats Directive. The intention was to revise the boundaries of SAC features and the extent of fishing activity as additional information became available. A toolkit was required so that the analysis could be repeated whenever revisions were made to the source data. The tools were created as a series of MapBasic scripts which used existing SAC, SAC feature, habitat and activity layers to calculate the areas of each habitat and feature affected by fishing activity. The outputs were to be used by CCW to determine whether sensitive habitats were subject to fishing activity and whether these situations occurred within SACs and SAC features. These outputs will allow staff to provide appropriate advice regarding planning applications, assist in the development of marine policy to protect sensitive habitats, provide a baseline to liaise with fishermen about where and how they fish and target management of SACs to areas which are potentially adversely affected by fishing activity.